Florida Keys' Newest Luxury Resort & Marina Representing a new concept that offers extraordinary luxury in the Florida Keys, Coral Lagoon Marina Resort is an exclusive, waterfront resort in Marathon Florida in the heart of the Florida Keys. For short stays or long, our unique dockside vacation rentals provides guests with luxury, resort amenities and all of the comforts of home. 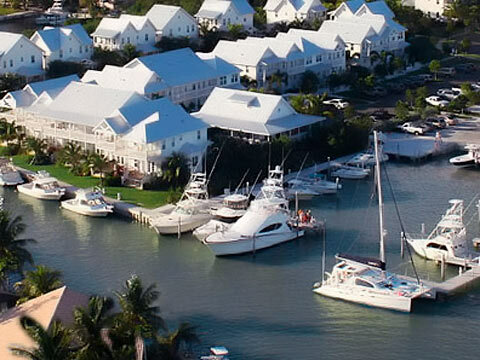 Located on nearly six acres of lushly landscaped property and on a private marina, our charming and intimate Florida Keys resort offers 25 richly decorated, yet casually themed, classic Key West Conch-style cottages and marina homes. Each unique, waterfront two- and three bedroom home includes exceptional amenities such as gourmet kitchens, dining table for 6, first and second level private shady porches offering spectacular water views, 42 inch plasma TV in the living room, premium cable service, DVD/Stereo system and original art inspired by the Florida Keys. A boater's paradise, Coral Lagoon Resort in Marathon boasts an onsite, full service marina and five-minute access to both the Atlantic Ocean for blue water offshore fishing and the Gulf of Mexico for backcountry, Tarpon, Permit and wreck fishing. Highly personalized services - including an on-site dock master - are available to guests at Coral Lagoon Resort in Marathon FL, catering to the needs of the most avid boater and angler. Resort Amenities include: Beautifully appointed, two- and three-bedroom marina homes Resort Style Pool Housekeeping services Full service marina Dockside marina store State of the art dry storage facility accommodating boats to 36 feet Wet slips accommodating boats to 50 feet. Boat rentals Charter fishing with the top captains in the Keys WI-FI high-speed Internet access Access to the beaches and pools, fitness center, gourmet restaurant and tiki bar just down the street at our sister resort, Tranquility Bay Beach House Resort. Located in the heart of the Florida Keys in Marathon, Florida Keys vacationers, romantic couples, families, as well as the most avid boater and angler will enjoy the best of both worlds: the adventure and thrill of a complete nautical getaway coupled with the comforts and benefits of their own home and four-diamond resort service in the Florida Keys.